RoyalEnfields.com: What is it like to own a Royal Enfield motorcycle? What is it like to own a Royal Enfield motorcycle? 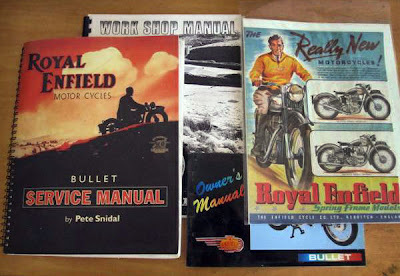 This Royal Enfield owner prepared himself with service manuals. What is it like to own a Royal Enfield Bullet? Let's ask the man who owns one — and is trying to sell it. "Of course it's not a 1955 Royal Enfield, it's a 2004 Royal Enfield Bullet 500ES. But everyone will think it's a 1955 bike. Actually most people will think it's an old Harley, because that's the only motorcycle they know. "This bike has plenty of upgrades: shorty exhaust (carb re-jetted), high-flow oil pump, solo seat with pillion, bullet turn signals, retro mirror, duckbill breather, pedestrian slicer, etc. "It has electric start, but I usually kick it for the full experience. Runs great, no problems other than being a 1950s British design — means that you will have to enjoy turning a wrench (points, timing, etc. ), and it will leave its mark. "Case is tight, but it will wet sump if you don't set it to Top Dead Center when you put it away (and sometimes even if you do). "It is a blast to ride, handles great, and each thump of the one-lung shoves you down the road a couple of feet. Tops out at about 60 (hauling my 215 pounds around). "This is not a highway bike. "This is not for someone who wants to go fast. "This is not for someone who doesn't want to turn a wrench." If this sounds right to you, his asking price is $3,200.